The San Diego canyon was moist and the only way means descending a steep slope. It may lead to a mean slide on dusty gravel but recent rains have muddied the hillside, making it a different kind of dangerous. Those rains have led to perfect growing conditions for wild, edible mushrooms. 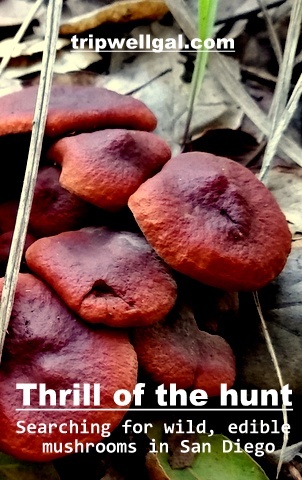 Be careful when hunting for wild, edible mushrooms. They’re tempting but be very careful when hunting. Every year someone makes the wrong choice. It can lead to a painful death or an evil stomach ache. Recently several Asian immigrants died from eating mushrooms that looked exactly like those they knew well back home. Angel of death – The white one on the right is the worst. Go with an experienced, local guide. I’m fortunate to have one in the family. 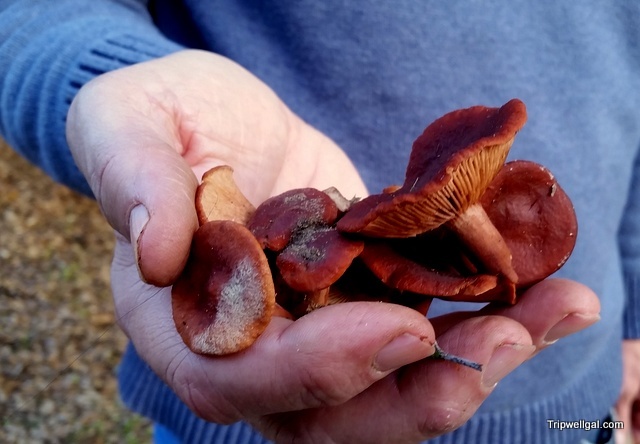 Dave Rudie has been hunting local, edible mushrooms for over 25 years. He’s obsessive, doesn’t take chances and tests. He never eats a mushroom when he’s even the slightest bit uncertain. He also knows several prime locations where edible mushrooms sprout, given the right conditions. Candy caps with dirty bottoms snapped off – the better to clean later. San Diego is built along a series of mesas. Its corrugated hillsides are topped with buildings. Suburban neighborhoods tower over shallow, narrow valleys. Most roads are not straight and drivers must learn routes that twist and turn. Major roads line the wider canyons and narrower ravines are peppered with hiking trails, some private and wild. Given the right conditions, a few of those hide small patches of mushrooms. My favorite mushroom harvest – pictures of various stages. I fudge and think, “Fungi aren’t plants!” We give back and always bring several plastic bags. 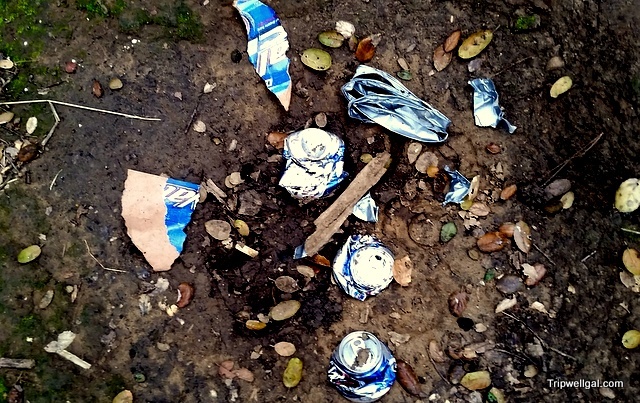 Most of the time they end up full of garbage. If we’re lucky a bag might carry a few wild, edible mushrooms home too. Wild, edible mushrooms sauteed in butter and garlic. It’s safest is to only harvest pictures and leave the fungus to whither, furthering natural forest cycles. Mushrooms are good mimics. The most poisonous look innocuous. Some you shouldn’t even touch. Know what to avoid. 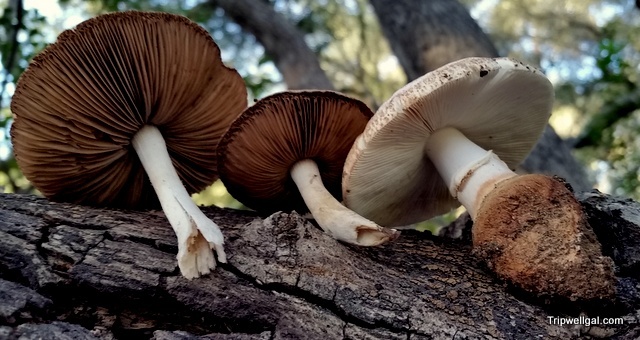 Join a club like the San Diego Mycological Society. Attend meetings and their annual festival. Find out what grows in your area. Only go hunting with experts. Read up on wild, edible mushrooms and study pictures well (see link below. )Learn testing techniques. Get a second opinion and don’t eat anything unless you are certain. ‘Maybe’ can be life-threatening. Pick safe, mature edible mushrooms and leave the smallest to grow. Most safe, wild, edible mushrooms need to be eaten within a day or two, if not hours. Read more: My post about a surprise, Thanksgiving mushroom harvest. I hope you enjoyed the post and will share it. Here’s a pair of pinable pictures! I love this, we just started mushroom hunting about a year ago. We met two ladies who have been picking wild mushrooms for years. They helped us out and next thing we knew we were hooked! It helps to live in the Oregon Cascades where they grow everywhere. You do need to be careful on what you pick but thank goodness Morel’s are very easy to distinguish which is what we are after. So cool, Nancy. I only wish that Morels grew here. They’re delicious and you’re so right, easy to distinguish. Happy harvesting! Wow! This is awesome! I always get amazed whenever I see wild mushrooms during my hikes. Glad that you notice them. I love getting out into the canyons here and spotting mushrooms is a bonus. Sorry, Inna, I’ve only gone with a mushroom expert who hunts under Oak trees. You might check out Torrey Pines but it’s pretty dry in that area. I’m a mushroom lover and have long wanted to go foraging for morels. I hear they are fabulously delectable and want to find out first-hand. Have you had them? I’ve eaten Morels but they don’t usually grow around San Diego. Very helpful article! Every autumn I promise myself to go mushroom picking but always fails so. I only know very few kinds! It’s perfect to know only a few kinds of mushrooms that are safe to eat in your area. I’ve only eaten two in about 8 years of picking and that’s fine. What a great experience. 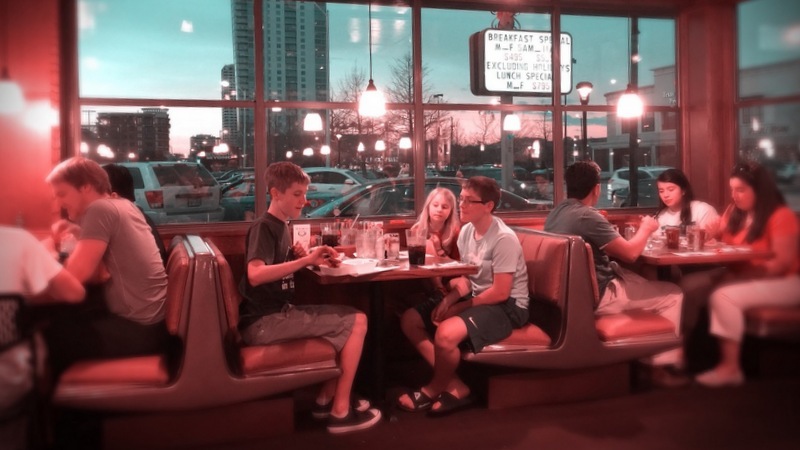 Your pictures look incredible! Thanks, Natasha. Glad you enjoyed the post. 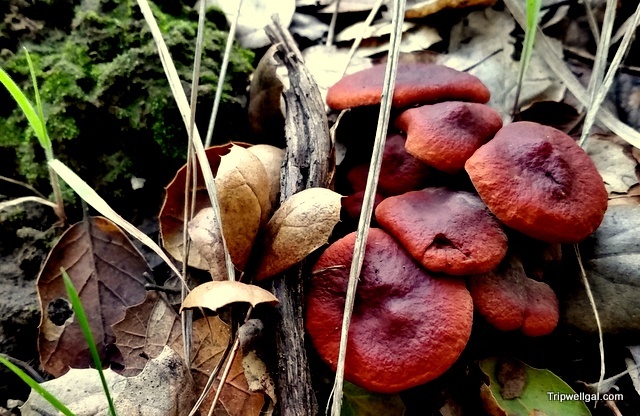 Great tips for mushroom hunting! Eileen, I hope they serve you well one day. What a great experience picking mushrooms. Would love to do that one day. My concern has always been know what’s good vs. not good! Like your advice of going with an expert. Good to know San Diego is a great spot for mushrooms! We’ve been fortunate this year certainly and I do feel blessed to have a local guide to rely on and explore with. I wish I have Dave’s ability to hunt for edible mushrooms. I think that’s such a badass skill and very helpful too. I love mushrooms but I couldn’t really tell them apart and I think I’d just let the experts do the hunting while I just buy them from the grocery. It is a cool skill and he’s honed it over decades in San Diego. You want badass then go ‘shroom hunting with his friends in the forests near Mendocino. Crazy crops up there. I am in love with mushrooms but I never really got around to learning which is poisonous or not. It might be a good time now to learn it (for survival purposes as well since I do have a knack for wilderness hiking). I’m not sure that Mushroom hunting would be a survival skill or at least only in the most dire circumstances. I’d like to learn how to forage for greens and roots, perhaps herbs too. Then we’d have a meal. Your post reminded me about my years in Romania, when my husband and I used to pick up mushrooms and cook them. We were very good at recognizing them and had no fear that we would die poisoned. However, since we moved to the States, I no longer dare to do that. The species that grow here are different from the ones I used to know so well and I don’t want to take any chances. How wonderful that memory is, Anda. It also fits with what I’ve learned – that’s it’s important to forage with a local guide who has lots of local experience. I hope you get to hunt again one day. Thanks for sharing all this info. I find it very interesting. This is something I would like to try. I once went into a foraging excursion and that was fascinating. You would not believe all the delicious food that can be prepared with thing gathered from public lands. I have also been on tours were the guides describe all the edible plants in the desert. That is interesting too. You’ve inspired me, Ruth, to find someone to take me foraging in the desert! Where in the world was that? 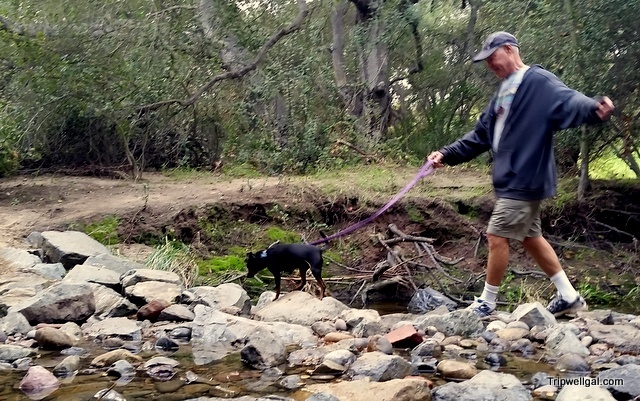 I love taking the pictures too, Lyndall, and rely on my expert hiking buddy for the rest – except the prep and eating part. I admire wild mushrooms from a nature point of view but I am more than happy to leave them growing where they are! We also have quite a few species over here that also look identical to their edible cousins, even sometimes growing close together. You’re a wise woman, Rachel. Like I repeated in the post, you have to proceed with caution and barring that, enjoy them for their odd beauty. This sounds like fun! 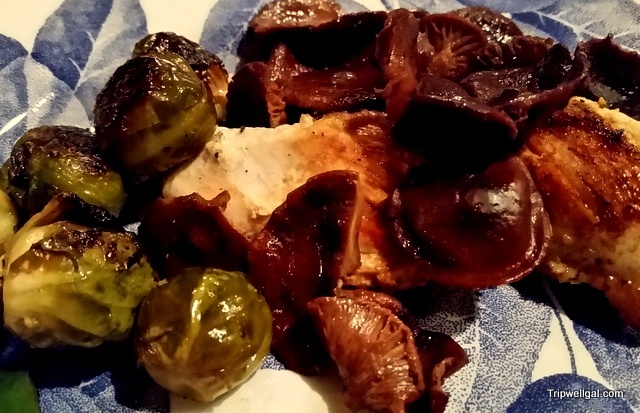 Love that you kept the meal simple too so you could really get the full flavour from the mushrooms. Ha ha, Amelia, yes, I do cook simply. Guess I’m lazy but also simplest is best with the wild mushrooms we harvest. It’s too easy to overpower their delicate flavor. I would be far too afraid to pick wild mushrooms, even with a guide. The consequences of making a mistake would be too great, and the differences are too subtle. It’s important to be comfortable about whatever you eat. I do trust my guide who’s been hunting in this one area for decades and is very cautious. I have never trusted myself enough to go mushroom picking. You really need to know what you’re doing or at least go with somebody who does. Absolutely and that was a big part of why I wrote the post. Be careful but then enjoy the adventure. I wonder, for example, whoever ate the first artichoke! Or Sea Urchin? I’d definitely want the help and expertise of a guide for mushroom foraging. It seems too risky to do on your own without experience. There is a very popular food foraging tour in NYCs Central Park. This reminds me that I’ve wanted to give it a try! I’d love to do that tour in the Park! I hope you get the chance to go. It’s crazy how they all look so similar! One has to be very careful when picking them, that’s for sure! When you’re standing in the forest you can see the differences. Testing makes all the difference. Some ‘bleed’ a different color when broken, some have a stalk mantle you only see when it’s picked and much more. Care is important. It’s not worth hunting if you get sick or much worse. Still I find it beautiful to find and appreciate how they look. I’m glad you had a chance to go picking. It’s a fascinating process and full of beautiful surprises. I’ve always wanted to forage for mushrooms, but too scared to attempt it because I’m not 100% sure what’s poisonous or not. So jealous! Check out a local group in your area. They often are happy for the company and you’ll learn so much. The concept of mushroom picking is so lovely! I would love to try it one day and come how and cook with my pickings! I’m sure you’d love it. I’d like to learn how to forage for roots and greens one day as well. Not a fan of mushrooms. But this does look interesting. It can be odd to think you’re eating a fungus! The shapes and colors can be something to see. I have never been mushrooming before, but it is on my list to do, perhaps I will find me an expert (like yourself) to hunt for mushroom with to ensure I don’t accidentally make me sick or worse. Its brekkie time, Im off to make some butter sautéed mushrooms. Yum! I’m no expert but only go foraging with my sweetheart who’s been doing it in this one area for decades. He wouldn’t be an expert any where else. It’s a very local hunt for us. Looks fantastic. I’ve always been a bit scared to forage for mushrooms. I guess having a good guide is the key. It makes the hunt much more fun to go with a guide. I hope you get the chance one day. It is rewarding on many levels. So glad you’ve had the experience. I’d like to go truffle hunting one day. I love mushrooms and have been mushroom picking with an uncle who knew the good from the bad. Not sure I would be too confident on my own though. Would never recommend going mushroom hunting without a knowledgeable, local guide and your uncle sounds perfect. Just stir them up in a little butter and garlic and definitely, yummy. As a photographer you have such freedom with a subject like mushrooms and can enjoy them on that visual level with abandon. 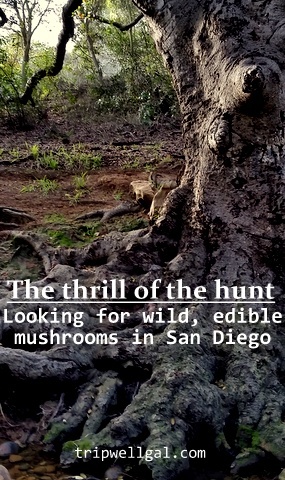 I love San Diego and been there several times but never been to mushroom hunting. Those mushrooms look fantastic and I love them. You are right, I have no idea how to pick the right kind and maybe that;s the reason why I always bought them at the grocery store. I love those pictures. Thanks, Marc. The ones at the grocery store will do. Perhaps you’ll find a specialty market or Asian grocery store. There’s so many different varieties to cook with. I used to go looking for morel mushrooms with my family all the time in the woods of Oregon. They were pretty easy to identify and to find. They’re really delicious, but super pricey in the store. It’s fun to find your own food! Morels are so delicious! It is fun to find your own food and pretty rare for a city dweller like me. Yes, us too. We’ve always lived in the middle of big cities. It’s certainly easier to buy the mushrooms than to go out and hunt for them! But what’s the fun in that? You’re right, what’s the fun in just buying mushrooms! But I do enjoy checking out the many different varieties in Asian markets especially. With so many different shapes and colors I consider mushrooms a visual, if not a gastronomical treat when I see them in my garden or on walks and hikes. I’ve never harvested any to eat because I’ve always been too leery of the trickiness of positive identification and possible deadly consequences of a mistake. It must be great to have an expert in the family. I’m glad you find mushrooms interesting but are careful about eating them. They are such incongruous plants. Eating a few safe ones is a treat.